On the evening of the day that I saw this exhibition at the National Gallery I had the good fortune to attend a final, blazing rehearsal of Beethoven’s Fifth symphony. It is a well-known fact that John Eliot Gardiner, who was conducting, is a charismatic communicator whose insights, investigations and revelations stretch far beyond the podium. The complex skeins of incantatory harmony and dissonance he drew out from his musicians seemed like synaesthetic versions of the paintings that I had experienced that morning in Trafalgar Square. Composed some 140 years after Rembrandt made his last painting in 1669, a mournful image of Simon with the Infant Christ in the Temple which closes this exhibition and was on his easel when he died, I felt Beethoven was working the same cathartic themes as the greatest painter who has ever lived. Sitting in the balcony of Hampstead Town Hall, I reflected on a man, who unlike Beethoven, had died bankrupt, defeated, bereft of the people he had loved, alienated by his critics and alone in his empty studio. I sat and pondered the challenges posed by an artist’s commitment to creativity at any cost; to the irreconcilable polarities of life and death; to a life spent taking the temperature of the delicate balance between loss and redemption, engaged in a thought experiment with the tug of revolution and the safety of the status quo. At one point John Eliot Gardiner asked his baroque trumpet player to tell the orchestra about something said by a friend who works in Formula One. He said (with what one hopes is a metaphorical rather than a concrete turn of phrase) that a great car has to be raced so hard and so fast and with such commitment that it should fall apart after a race. That is how Beethoven should be played, and that is exactly how Rembrandt paints. The National Gallery’s exhibition, which it bills as a “once in a lifetime” event, is a huge amazing array of 90 works, including drawings and etchings (and what a superlative draughtsman he is too) which extends art to the very margins of what is humanly possible. We are privileged to see some of the greatest, and possibly the very greatest of his self-portraits – the 1659 canvas from Washington. 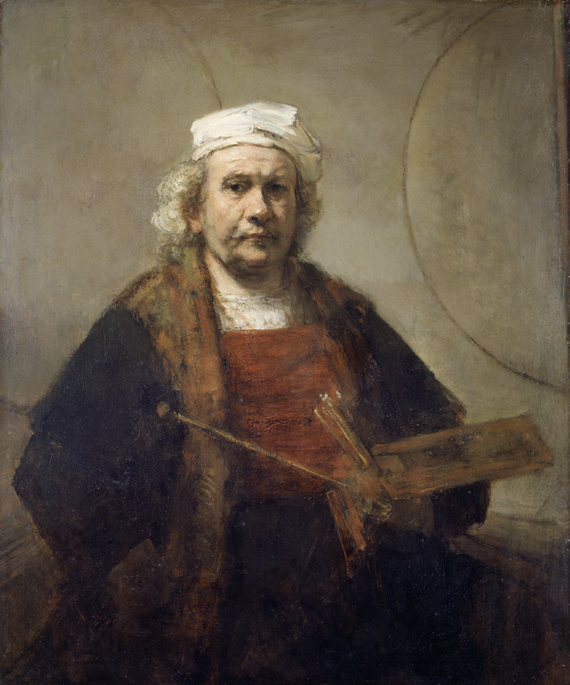 Rembrandt’s brutal, unsparing honesty in depicting himself – go beyond time, which is the core of what art is about. Rembrandt’s eyes gaze out at us with tenderness, empathy, melancholy, pathos, self–scrutiny and understanding. They communicate back to us about what it is to be human. The flesh droops and sags and the beady eyes have seen everything and nothing surprises. The body is weak and no matter how extravagantly costumed, it sags under its existential burdens. I remember a play by Colin Welland called A Roomful of Holes about love and Rembrandt and it is true – his paintings are so deep that you can fall headlong in love over them. Whether you know the circumstances of his life – and they are dramatic – is irrelevant. I defy anyone to go to this show and emerge unchanged. It happens to me every single time. I go into a museum to look at Rembrandt feeling jaded, artistically and emotionally blocked and emerge fortified and engaged with life. Each painting operates at the edge. They are, like the Formula One car and like Beethoven, working on the very margins of possibility. I have to declare an interest here. As a painter Rembrandt has always been THE ONE. My very first art school project 45 years ago was a copy of the magisterial 1661 Margaretta de Geer, Wife of Jacob Trip in the National Gallery. I sleep every night in a room with Rembrandt etchings of dubious origin and variable quality on the wall. My daughter is named after his beloved wife Saskia. 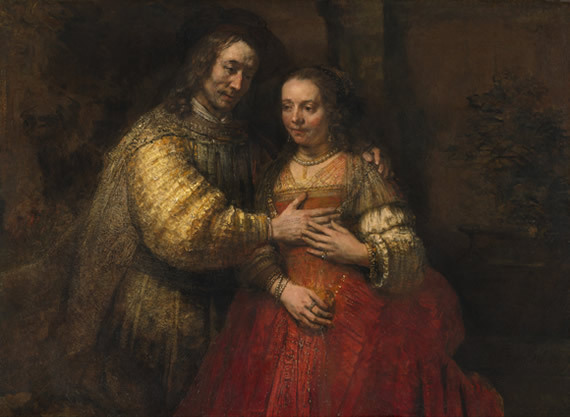 I make frequent trips to Kenwood House in London to visit his Self-Portrait with Two Circles and to the Rijksmuseum in Amsterdam to visit The Jewish Bride, also known as Portrait of a Couple as Isaac and Rebecca, a reproduction of which has been in my studio since I first started painting. The Rijksmuseum have been extraordinarily generous and The Jewish Bride is delightfully present in this show, meaning I have seen it twice in 2 months in 2 different settings. Happily, both these paintings are in this exhibition. Van Gogh confessed to a friend that he would gladly have sacrificed ten years of his life to sit for two weeks with only a crust of bread in front of this painting. It brings out the dramatic in all of us. It is about love and tenderness. But in its furious scumbled three dimensionality, it is also a template for the future of painting. I recently gave a lecture and included details from it in my presentation and completely foxed my erudite audience who were sure they were looking at Abstract Expressionist art from New York in the 1950’s. Not unlike Jackson Pollock, Rembrandt paints with body and soul, his palette knife working with a gestural vigour we associate more with the 20th century rather than 17th century Dutch art. Each of the works in this show inspires us to feel and think and see that the meaning of art and life is about pushing what is possible to its outermost reaches. The Formula One car is just about to fall apart and explode. Go see. Go see. Go see. Open daily 10-6pm. Admission £18/£16. 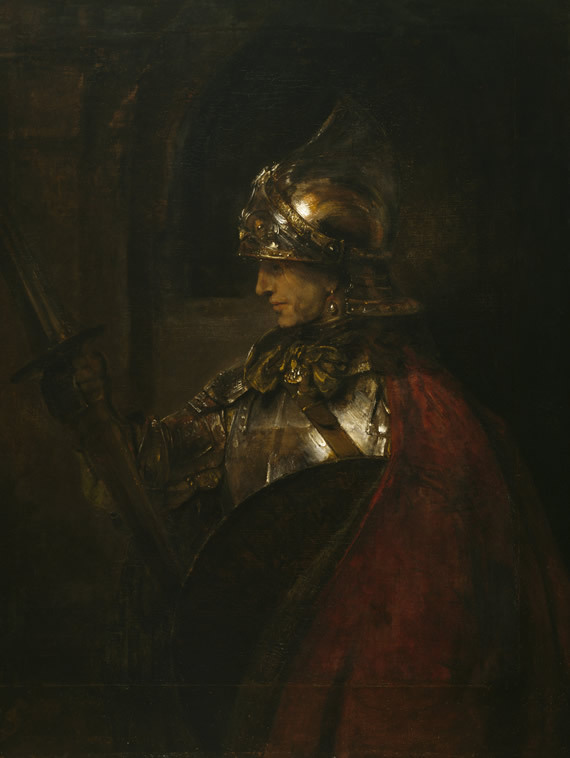 From 2 December, Exhibition on Screen: Rembrandt from the National Gallery London and Rijksmuseum Amsterdam will be in cinemas around the country.